Presentation to PPGM Bro Colin T Wyse PM. Brethren - as you may know, Brother Colin is approaching his 70th year in the Craft and there will be a presentation to him on this auspicious occasion. It will take place at Lodge St. Servanus's Special Meeting, which will be a Second Degree, on Monday 12th November 2018 at 7.30 pm. 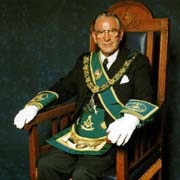 The RWPGM will head the Deputation from Provincial Grand Lodge and looks forward to a large turn out.